Long before Metrolink, rail transportation played a vital role in Covina's history. In 1876, the Southern Pacific Railroad became the first to connect Los Angeles to a transcontinental rail system, but the line passed through Spadra and Puente to the south. 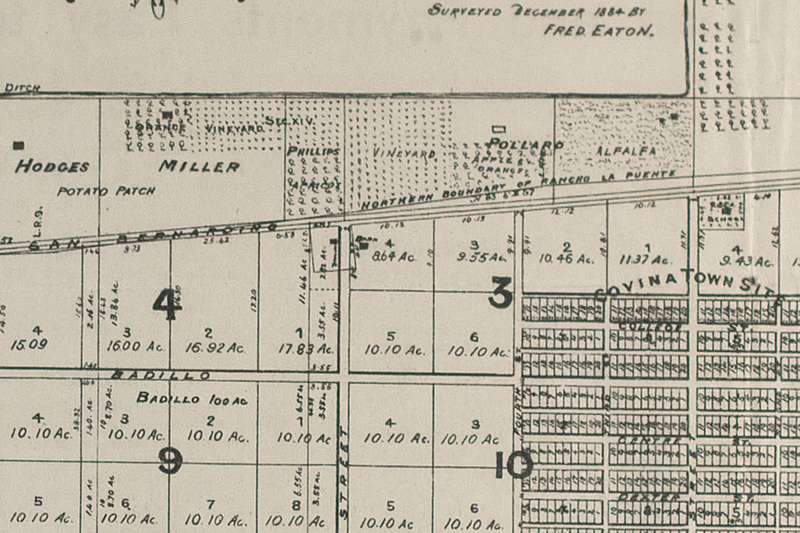 The Atchison, Topeka & Santa Fe Railway arrived in L.A. in 1887, but it, too, bypassed Covina: this time to the north, via Alosta, Glendora and Azusa. It wasn't until September, 1895, that the Southern Pacific opened a spur through Covina (today's Metrolink San Bernardino Line), offering service to Los Angeles and points beyond. The S.P. 's primary purpose was transporting freight, however, so consequently, people who wished to travel by rail had very limited choices in terms of departure and arrival times. Conveniently-scheduled passenger service wouldn't be available to Covinans for another dozen years, when Henry Huntington's Pacific Electric Railway Company came to town. The first spike was driven for the P.E. 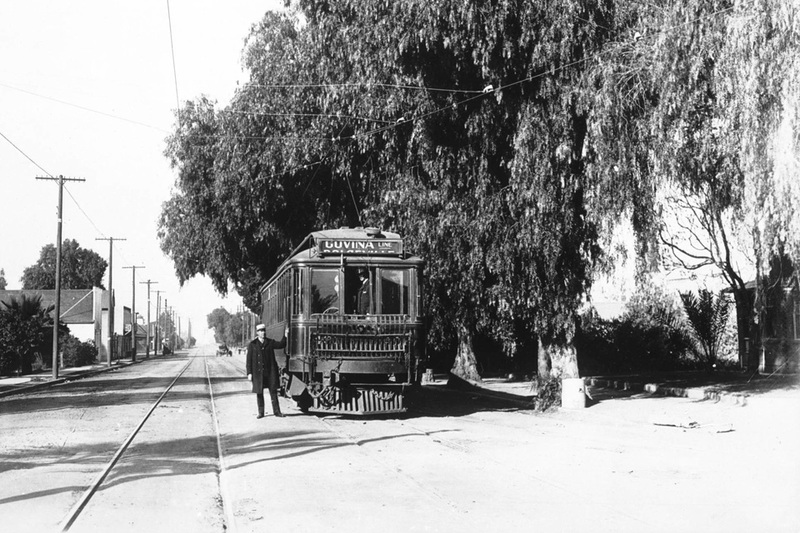 tracks on Badillo Street on November 5, 1903, but the little trolley shown below only ran between Hollenbeck and Barranca Streets. The Covina segment was opened to the rest of the Pacific Electric system on June 5, 1907. 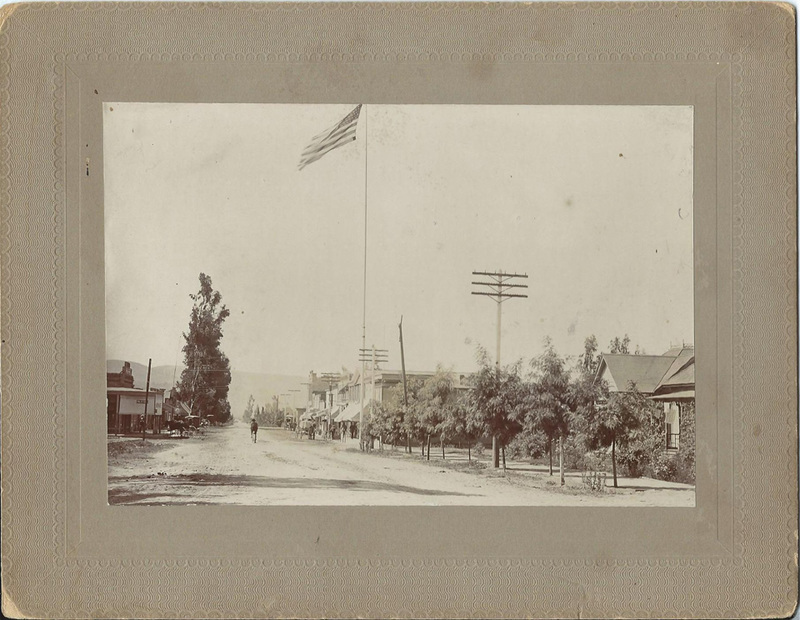 Intersection of Citrus and Badillo, circa 1905. Courtesy USC Digital Library. 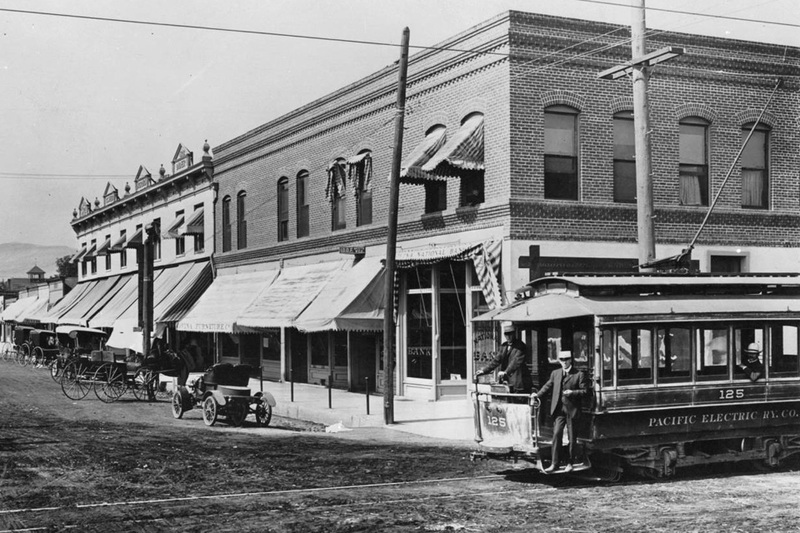 An early interurban Pacific Electric train on Badillo Street (below), circa 1910. The original round-trip fare to Los Angeles was 90¢. (Sounds like a bargain, but that's about $25 in today's money.) Ticket in hand, then, a one-way trip to the big city took just under an hour. 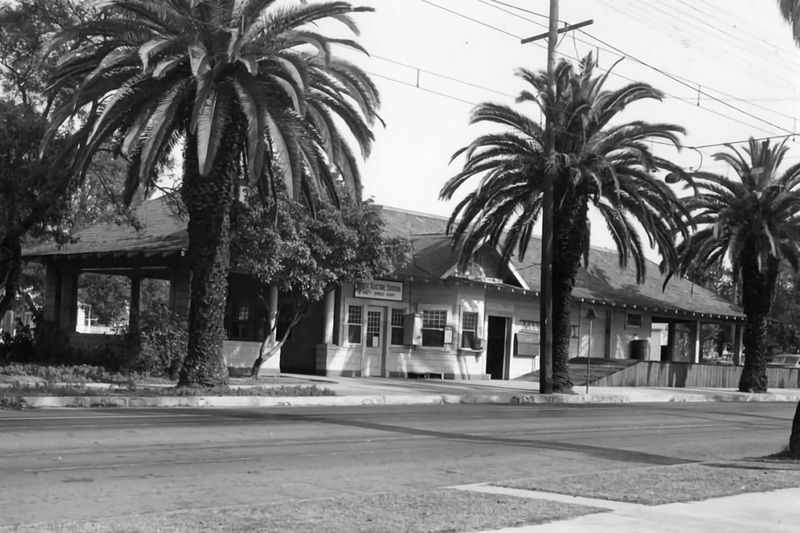 Pacific Electric's Covina station, circa 1937. It was located on the north side of East Badillo Street a short distance east of Second Avenue. It was Covina's commuter connection to the P.E. network from 1915 until regularly-scheduled service was discontinued in 1947. Recently Karl Blackmun, one of our new members gave us a copy of his great grandmother's memoirs of her life in Covina in the early days. Her name was Clara Margaret Eckles (1874-1966). She married Carl Warner, best known in Covina as the younger brother of Elwin Perle Warner, long time prominent Covina grocer. Her memoirs paint a picture of life in this area before 1900 and relates some of her contacts with such early residents as Antonio Badilla, Lucky Baldwin, and Joseph Phillips. Of particular interest is her account of how Covina received its name. Most of us have heard that the name came from the location, as a cove between the San Gabriel Mountains and the San Jose Hills at least partly filled with vines. After all, Baldwin Park was for many years called Vineland until the residents changed the name in order to curry the favor of Lucky Baldwin. 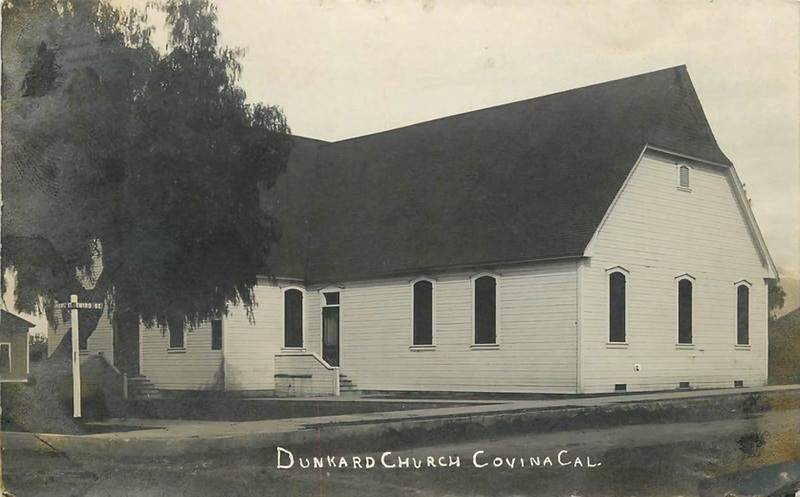 The Dunkard Brethren were colonizing Covina, only that wasn't its name yet. One day Phillips called father over to do some surveying and to give some advice. It seemed the colony of Brethren wanted to name their section, "Los Covinas." They thought it was Spanish for "The Little Cove." "Los" was the only Spanish part of it, and Mr. Phillips didn't want to hurt their feelings by pointing out their mistake. Besides, there wasn't any cove present! So a compromise name was suggested, that of "Covina," the leaders were consulted, and the town named before it had time to catch its breath. 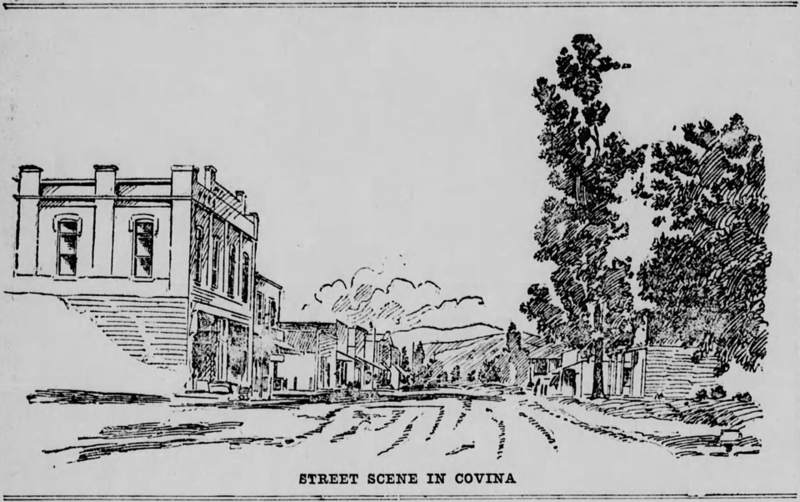 I think that is a better story for the naming of Covina than any that I have heard, and besides, it is an account from someone alive at the time; I am accepting it. More of Clara's memoirs later. 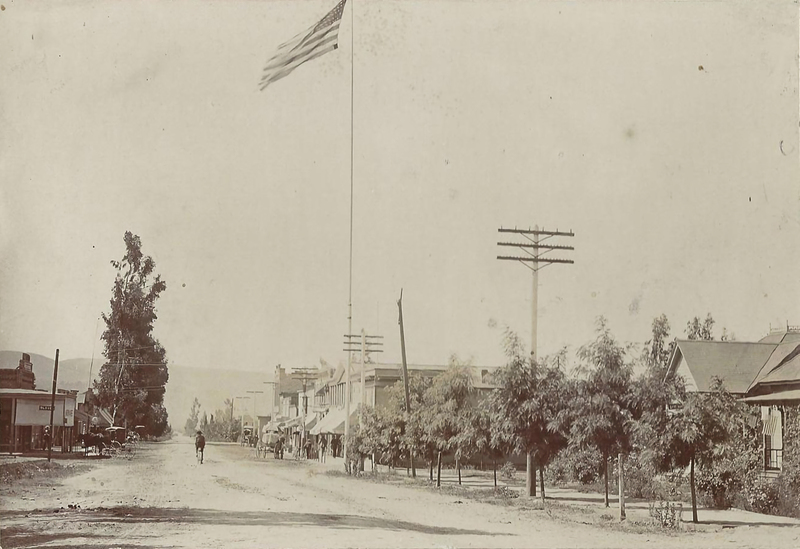 This article was originally published in the June, 2018 issue of "The Covina Citrus Peel," the official newsletter of the Covina Valley Historical Society, and is reproduced here with the permission of the author, Covina historian Glenn Reed. German Baptist Brethren church on Third at Puente, circa 1920. Thomas Ruddock died in 1890 at the age of 71, and left Mountain View to his wife, Maria Nancy Newell Ruddock (b.1827).1 When she passed away in 1905, son Charles Homer Ruddock (1848-1929) inherited the property. 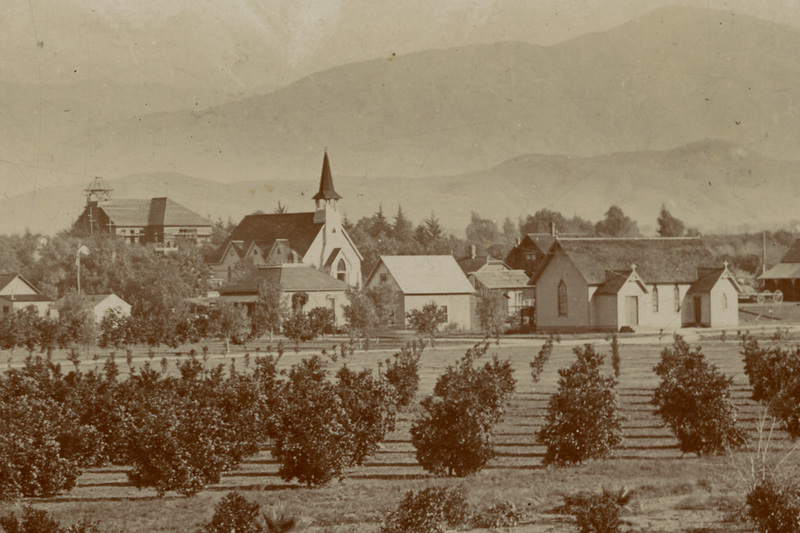 Ironically, for all its local fame in bygone days, few photographic images of Mountain View were known to have survived. 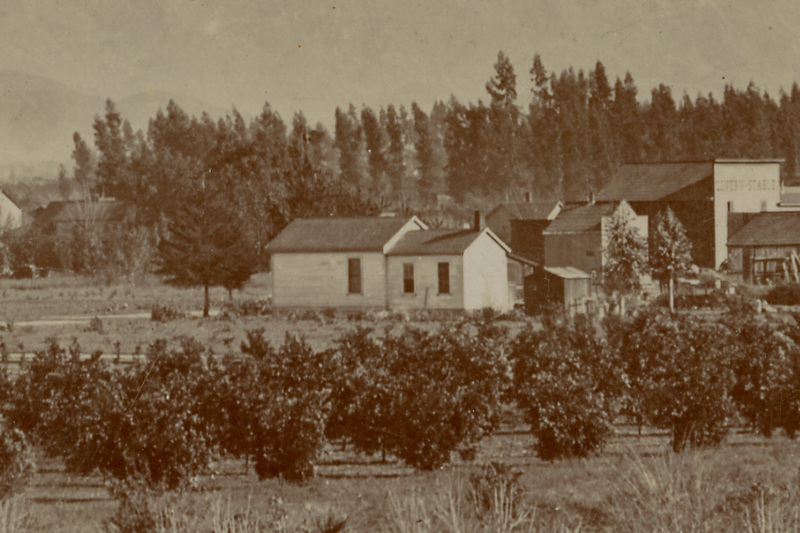 Recently, however, I made the acquaintance of Mary Elarton Kidd – whose great aunt was the last resident of Mountain View – and she has shared with me many photos of the ranch which have never before been seen by the public. 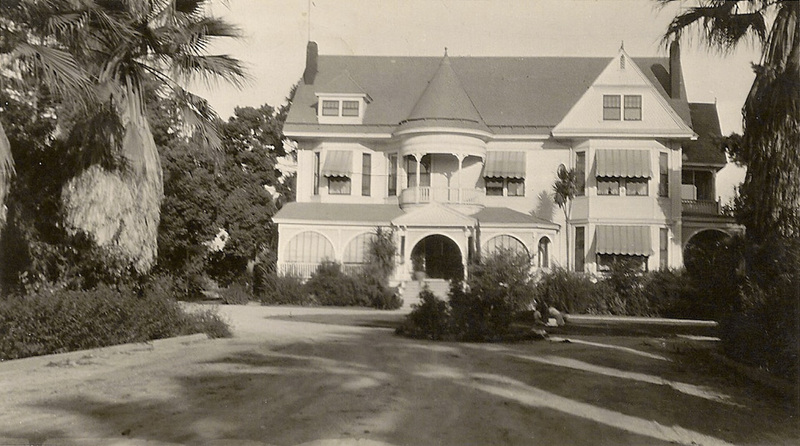 The Ruddock Mansion, 1886-1950. Photo courtesy Mary Kidd. Click image to enlarge. 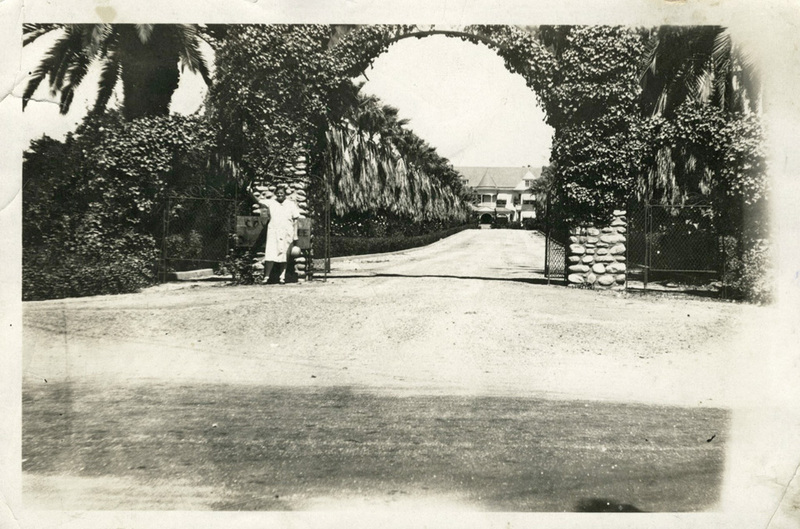 The entrance to Mountain View, formerly located at 522 North Grand Avenue5 at the eastern end of San Bernardino Road. The mansion itself was located immediately east of the intersection of today's East Wingate Street and South Westridge Avenue. 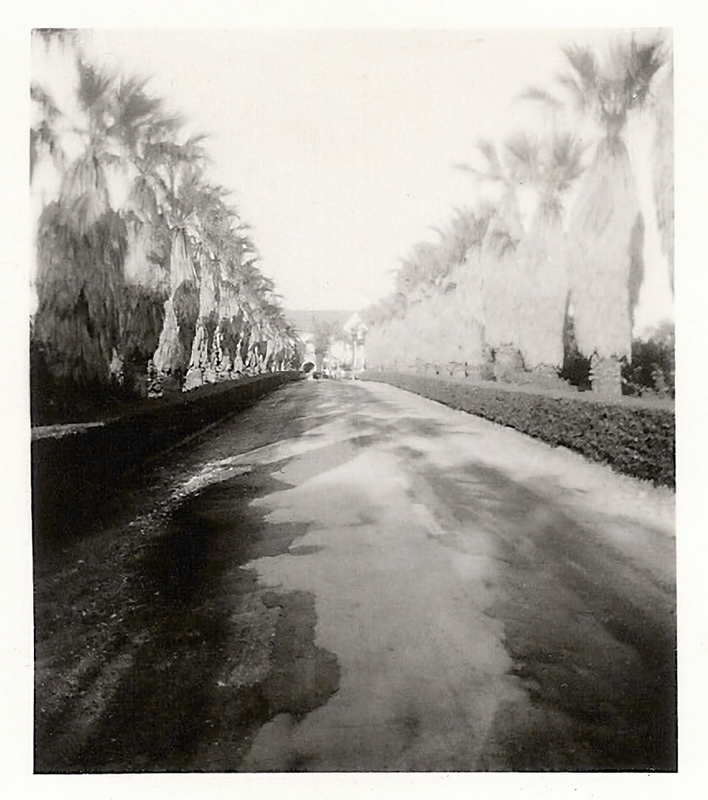 Planted over 130 years ago, the Washingtonia filifera fan palms that still stand today along East Wingate Street are among the oldest trees in Covina (together with the palms that line Hollenbeck Street). Here they are in the 1940s, when they were already six decades old. 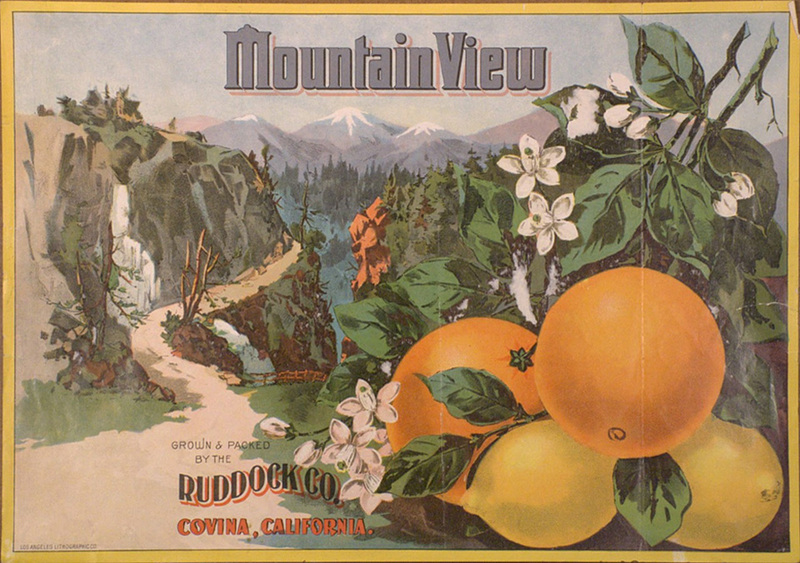 A Ruddock Company citrus crate label. 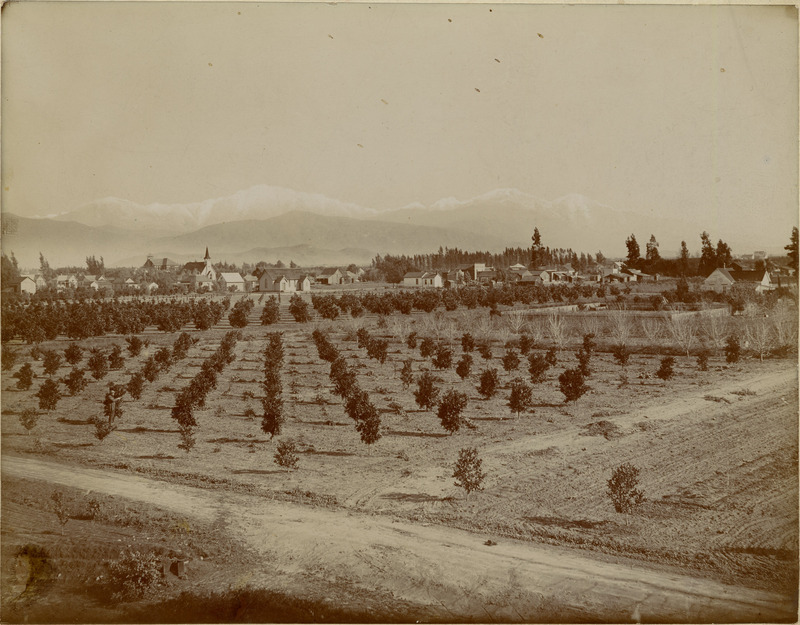 At its peak – just before the turn of the last century – approximately 9,000 orange and 3,000 lemon trees1 grew on the estate. Most people today don't know this, but from 1863-1935, local National Banks could issue their own banknotes, which were legal tender anywhere in the United States. $5 note, Series of 1882, Charter date 1901. Portrait depicts the late President James Garfield. Click image to enlarge. $10 note, Series of 1902, Charter date 1921. 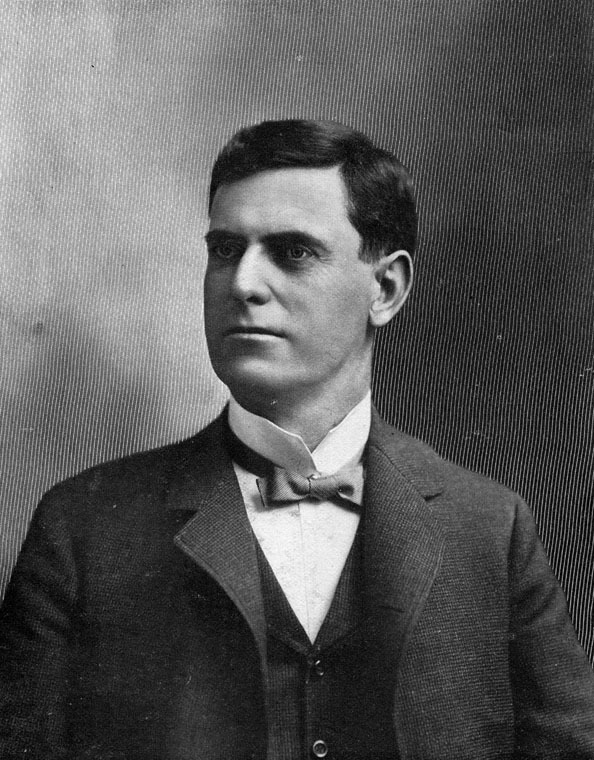 Portrait depicts the late President William McKinley. Click image to enlarge. $20 note, Covina National Bank, Series of 1929. Image courtesy seller jscabani1988 on eBay. 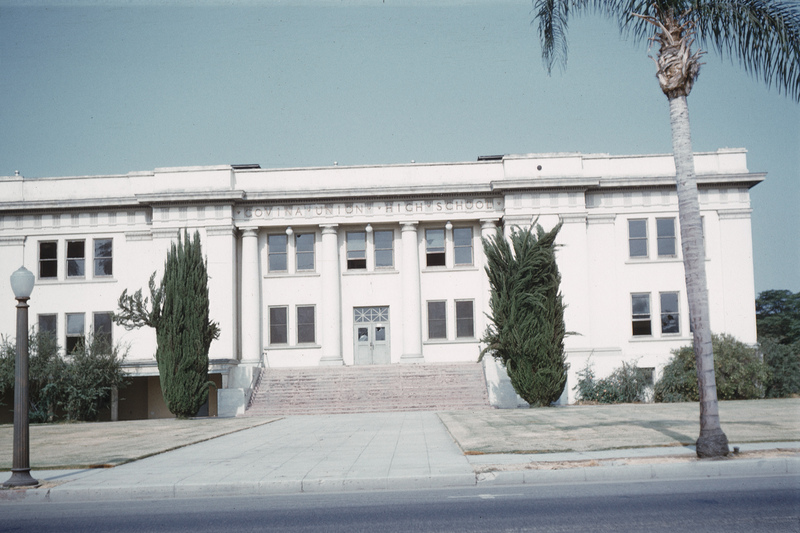 Below are some historical photos of Covina's two chartered National Banks. 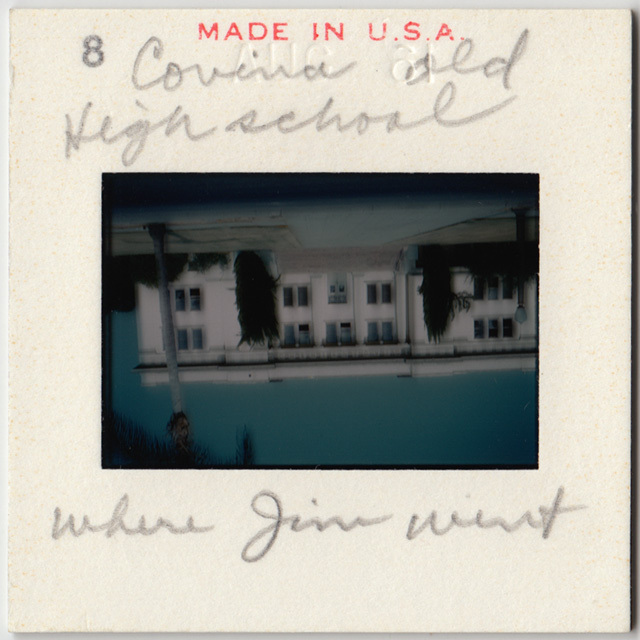 Recently added this Kodachrome transparency to my Covina ephemera collection. 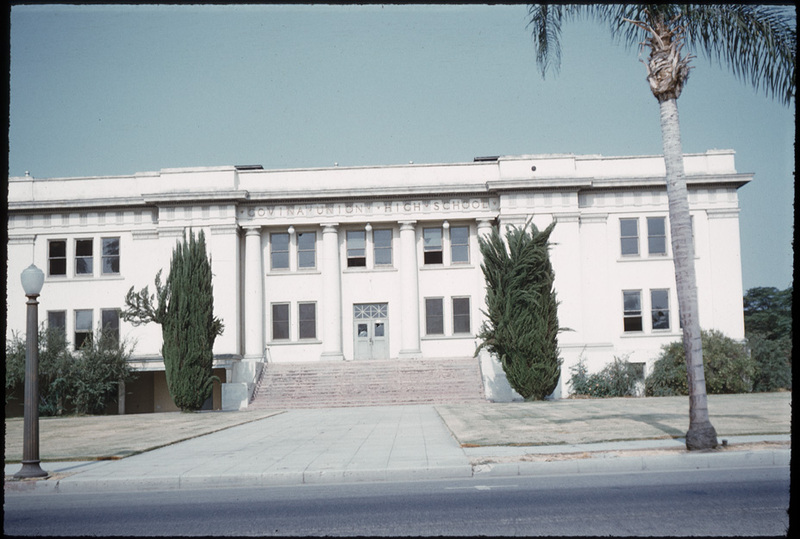 It's likely one of the last photos ever taken of the old Covina Union High School building on Citrus at Puente before it was set afire and subsequently demolished. If you look closely, you can see several windows have been broken, and even though the place was abandoned at this time, the grass looks like it's still being mowed regularly. Note the date impressed on the slide: AUG 61. Seeing the burned-out high school after the arson fire was one of my earliest memories of downtown Covina. I previously thought that was in 1960, but the date on the slide clearly shows the building was still standing a year later than that. 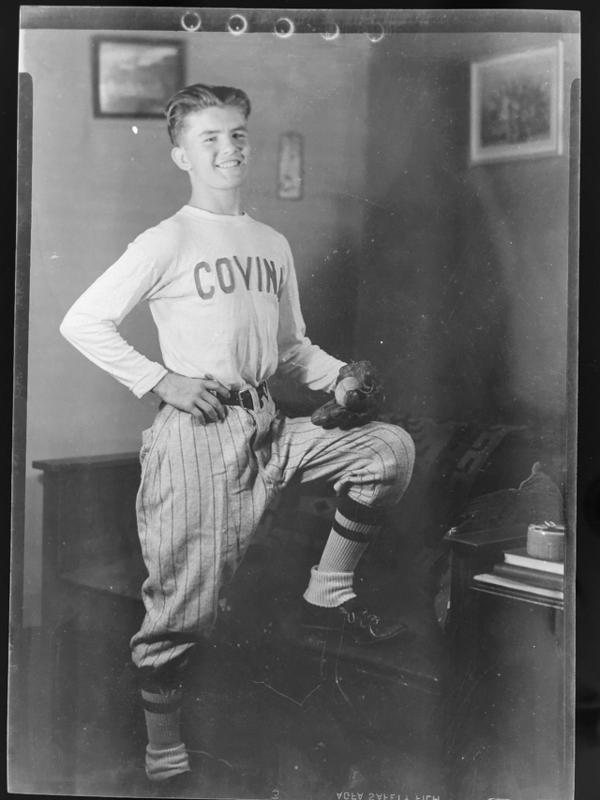 Unknown Covina Union High School Colt varsity baseball player from the 1930s. 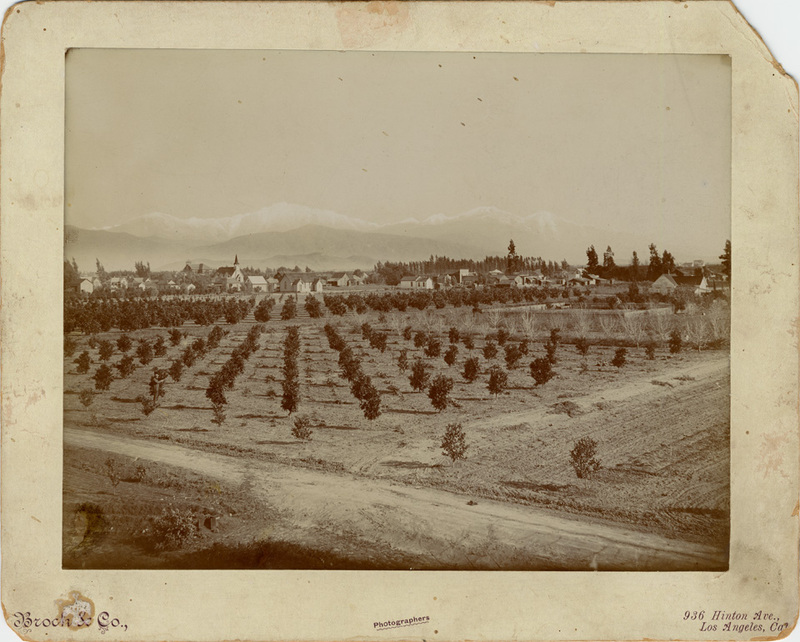 Photo attributed to Burton O. Burt, who was active in California and the Southwest in the early 20th century. Image courtesy of seller tobeacat66 on eBay. Some people I showed this to thought it might be a picture of a young "Doc" Sooter – the semi-legendary CHS sports coach – but one of them asked his surviving brother about it and it turns out Doc was still living with his family in Missouri at the time this photo was taken. So the young man's identity remains a mystery. Anyway, regardless of who it is, this is a great image of a pre-War Covinan! His face really lights up the room, doesn't it? Note: this 5x7 negative is currently available on eBay. Either click on the picture or this link, and it will take you to the ad page.